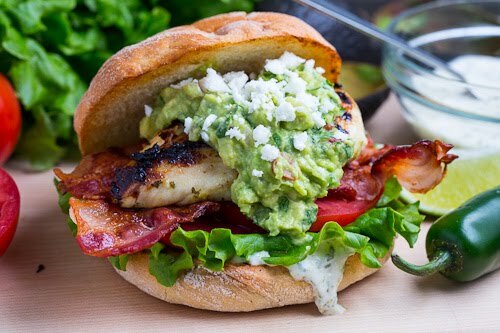 A tequila and lime marinated grilled chicken club sandwich with bacon and roasted jalapeno mayonnaise. These are messy but oh, so good. If you want, slice the chicken before adding to the sandwich. Puree the tequila, lime juice, oil, lime zest, jalapeno, garlic, cilantro, cumin, salt and pepper in a food processor. Place both the chicken and the tequila mix in a freezer bag and marinate over night in the refrigerator. Heat grill to medium-high, brush grill with oil and grill the chicken until cooked, about 5-7 minutes per side.